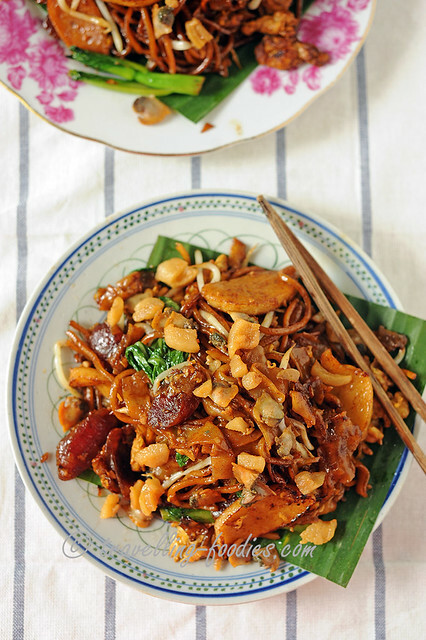 Among the numerous popular hawker favorites, char kway teow has a special place in the hearts of many. It is a traditional fried noodle dish whipped up by street hawkers who gathered at the now-demolished Ellenborough Market just across Clarke Quay along Singapore River. The area was also a well known enclave of the early Teochew settlers who knew this place as tsah tsun tau 柴船头, owing to the provision of fuel-related goods like firewood, charcoal and kerosene in this area. At night, some of these hawkers take to the nearby old Thong Chai Medical Institution 同济医院 for the supper crowd who flocked here after a session of tua hee 大戏 aka Chinese wayang opera nearby or a movie produced by Cathay Organisation at Majestic cinema just a short stretch down Eu Tong Sen Road. But as peddling of street food waned in the 1980s as it became outlawed, gone were the days when these illegal hawkers had to scurry and run away from the health inspectors, colloquially known as 地牛 “tee gu“. Together with the establishment of hawker centres around the island, local delights like char kway teow spread to the heartlands and became everyone’s favorite as well.